Address: 1200 Shoal Creek Blvd. Austin Athletic Club. Note the painted sign. Austin has a history of physical activity and in at least one spot a physical reminder of an active past. 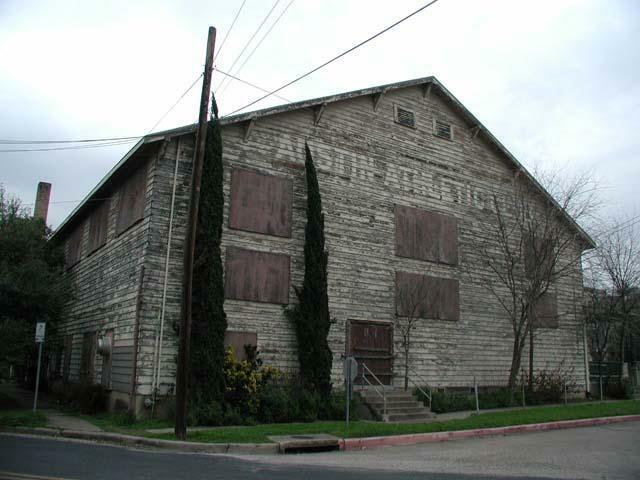 In 1931 the Austin Athletic Club was built by the Austin Parks & Recreation Department. The price for membership in the 1930's ran at $1 per year and $1 per month. Of course that was when a buck was really worth a buck. The facility had a name change in 1971 when it became the Austin Recreation Center, a name that is used to this day. 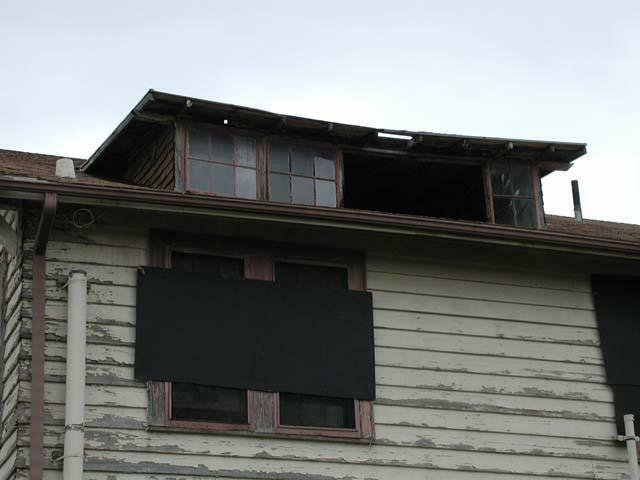 However, this building's fate was partially sealed 10 years later. In 1981 Shoal Creek reminded Austin that she was not to be ignored. A massive flood hit on Memorial Day. Homes, cars and people were all lost to the raging waters. The flooding reached the Austin Athletic Club too and the damage prompted the city to draw up plans for a new recreation center. Somebody forgot to clean up before leaving. In January 1987 the doors of the Athletic Club were closed for good. The new recreation center is designed to avoid the problems inherint in the old building. The new structure is farther from the creek and resides on stilts. Although the original plans for the new facility included the destruction of the old one, the city has never approved funds to accomplish this. So the 70+ year old building sits with no future in site. As the roof and windows give way deterioration accelerates. The building is not in use and continues to weather badly. The tennis courts of the recreation center abut the building and although some use the back porch of the old building for shade it is otherwise completely unused. 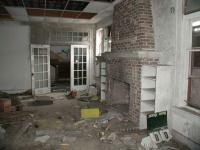 Note that although we have a photo of the building's interior we did not break into the structure. 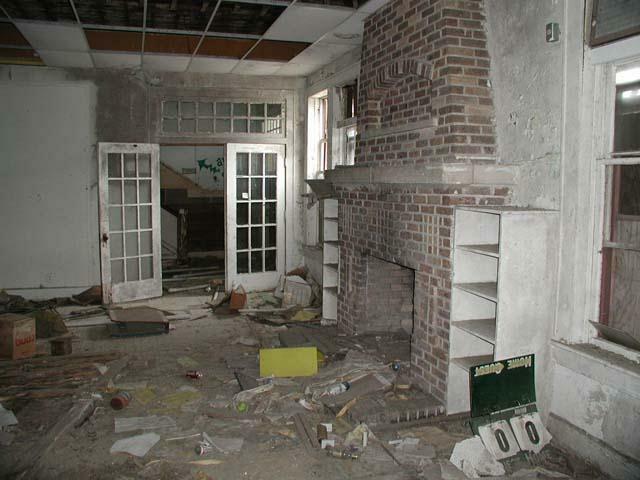 One of the doors on the back porch included windows, long since broken, that provided ample space to stick a camera in and snap a photo. Sooner or later the city will get around to demolishing this stately structure. Visit it while you can if you happen to be hiking along the Shoal Creek Greenbelt, which passes right next to it. Update (June 3, 2006): The Parks and Recreation Department and the The Historic Landmark Commission are debating what to do about this building. $340,000 to tear it down or $3,000,000 to restore it. News8Austin.com has a story about the competing interests. Update (January 10, 2008): The Austin Athletic Building is no more. I'm not sure when the demolition occurred, but today a brand new parking garage for Austin Community College was well under construction. Stopped by the site of the old Austin Athletic Club so that I could log the visit. Photos are from an earlier visit before logging was possible for historic sites and before the old building was torn down. The ACC parking garage nearby just doesn't have the same nostalgic feel to it! Written by local experts and critics, Fodor's CITYGUIDE is the ultimate resident's guide to the city. For newcomers and suburbanites, it's a shortcut to knowing the city like a native. And, for urban know-it-alls, it's the perfect desktop reference and may even point out a few secrets you haven't uncovered yet! Everyone will appreciate the comprehensive coverage, dead-on reviews, and the atlas of full-color maps. Hundreds of restaurants Local eating-out gurus give you the lowdown on landmarks, trendsetters, and cozy neighborhood finds in all price categories. Shops galore Let our shopping dynamo show you the best and the latest in every category all over town. We cover more ground than any shopping guide. So if it's sold in the city, you can read about it here. All the sports and outdoors Our outside enthusiast hits all the bases, from martial arts to bike rentals, walking tours to unusual places to ponder the view. Basics and beyond Parking and recycling, ballroom dance and cooking classes, on-line resources and the cable guy ? it's all inside. Color maps of every neighborhood They're spectacular and easy to read ? and every shop, restaurant, and sight is keyed to the maps. Plus, you'll find maps of UT, Zilker Park, and more.